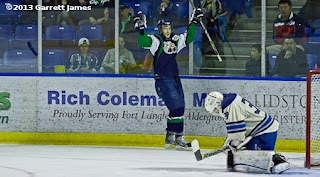 After beating James Barr twice in the first two games of the series, the Surrey Eagles exploded for six in a convincing 6-2 victory over the Langley Rivermen in Game 3 of the Mainland Division Semi-Final at the Langley Events Centre on Monday night. The Birds now hold a 2-1 lead in the best-of-five series. Surrey got out to a strong start when Michael Stenerson knocked home a rebound less than three minutes into the game on the Eagles’ first power play. The Birds had a number of chances to extend the lead in the first, but Barr turned aside the remaining chances. Surrey had a scare midway through the frame when Brady Shaw stayed down on the ice after colliding with Rivermen defender Aaron Dolby and going hard into the end boards. Fortunately for the Eagles, Shaw was able to skate off under his own power and returned to the game before the end of the first. Craig Wyszomirski found the back of the net early in the second to double the Eagle lead when he wired a wrist shot past Barr from the high slot. Langley responded a few minutes after Wyszomirski’s goal when Michael Santaguida mishandled the puck in the left corner and Mario Puskarich fed in front to James Robinson who tallied his first of the post-season. The Eagles found their offensive stride in the third. Shaw netted his first of the playoffs in the early going after a nice pass from Stenerson on the end boards. 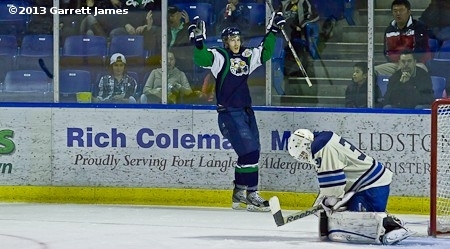 Adam Tambellini joined the scoring party as well with a pair of goals -- both wristers that beat Barr on the glove side. Nic Pierog scored Surrey’s last goal on the power play when he drove to the front of the net from behind the goal line and got two whacks at the puck before batting it out of mid-air into the net. The Rivermen got a late goal on the man advantage with only four seconds remaining as Trevor Cope shoveled the puck past Santaguida. The Eagles out shot the Rivermen 36-27 and went 2-for-5 on the power play while Langley was 1-for-3. Surrey will have a chance to end the series on Tuesday night when the two teams go head-to-head again at the LEC. The face-off will be at 7:15pm.